Fresh mint, paprika and harissa gives a North African flare to the typically boring American dinner dish. Depending on who you ask, meatloaf is one of those dishes that people love to hate. This recipe is a Game Changer! 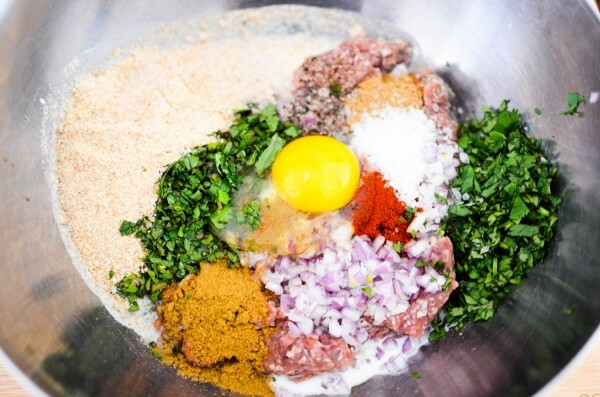 Keeping it simple (mix everything in one bowl & shove it in the oven), the herbs & spices will keep it bold and interesting with every bite! While your oven is preheating, combine all ingredients except the ketchup & harissa in a large bowl. Mix well. Hand mixing works best. As tempting as it is to use lower fat beef, DON’T. Leaner meats won’t have the fat content to properly firm up this loaf to keep all the juices in, leaving you with a big watery mess. Plus, fat adds flavor! Press mixture into a 1/2 sized loaf pan. If you don’t have one, a regular sized loaf pan can be used, just be sure that the meat mixture is all on one side. You want a short, thick loaf, not a long shallow one. Be sure to leave at least 1/2″ of room on top for the harissa ketchup. In a small bowl combine ketchup & harissa. Pour mixture over the meatloaf, letting it run down the sides. Harissa can be adjusted to your desired spice level. Harissa, a North African spicy chili paste, can be most commonly found in ethnic grocers, particularly ones that specialize in Middle Eastern or French cuisine. If you cannot find any locally, Saveur has a recipe where you can make your own at home using a food processor. Bake for 45 minutes. Once the meatloaf is done, allow it to rest for 15 minutes before cutting. This will allow the juices to settle, otherwise they’ll press out while cutting. Let rest 15 minutes before cutting.